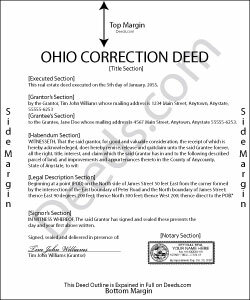 In Ohio, a deed can be corrected either by re-recording the prior deed with corrections made directly on it, or by recording a new deed, called correction or corrective deed. In both cases, the reason for the correction, the recording number and execution/recording dates need to be stated. The choice between the two options may depend on county preference or the nature of the defect. Correction in general is only effective when it clarifies or completes the title of the prior deed. Altering the nature of the document by means of a correction deed is not advisable. Thus, correcting the name or missing initial in the grantor's or grantee's name, the grantee's tax address, a minor error in the acknowledgement or even in the legal description can all be achieved through a correction deed. If the grantor re-acknowledges the corrected deed, errors of omission can be resolved as well, as can the marital status and spousal release and more serious errors in the legal description. The Ohio Bar Association publishes guidelines for title standards and advise to never use a correction deed in order to add or delete a grantee, to make major changes in the legal description, such as a changing the lot number, or to add or delete restrictive covenants or easements. Taking minimal requirements for sufficiency and definiteness as the standard for effective conveyances, they list and explain errors that may not impair the marketability of a title and indicate that "lapse of time, subsequent conveyances, the manifest or typographical nature of errors or omission, accepted rules of construction and other considerations should be relied upon to approve marginally sufficient or questionable descriptions" (Ohio Title Standards, section 3.2, 2012). In many counties, submit all deeds to the assessor prior to recording. Sometimes, only changes to the legal description need to be approved by the auditor before they can be recorded. The statement of value form DTE 100-EX needs to accompany the correction deed and indicate the reason for exemption. Bear in mind, however, that any changes to the legal description may affect transfer tax assessment. Spend time considering the different outcomes of each option and contact the local authorities, either the recorder's or the auditor's office for specific requirements and practices.